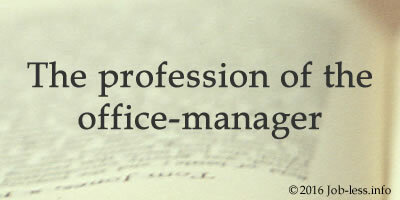 The profession of the office-manager has appeared rather recently. Before that, people of such profession were called "administrator", but with a change of business the specialty of the office-manager has acquired new features. Frequently, office-managers are confused with the secretary, the HR-manager and the administrator. Partly the office-manager carries out both those and other functions, but only partly. As a matter of fact, some other qualities are inherent in the work of this position. The office-manager is the expert who engages in management of all office services, coordinates their work and also is occupied with office supplying by necessary expendables. As a rule, the office-manager submits immediately to Director General or the Deputy Director of Personnel Management, sometimes he complies with the Head of Department of the Personnel Management. - obligations of the translator - such requirement is presented just in Western companies. These are main fundamental obligations, but as representatives of recruitment agencies say, in the different companies, in addition to above-mentioned functions, the most different requirements are imposed to office-managers. In the Western companies, most often, the office-manager combines such functions as the owner of the office + the secretary + the personal assistant. In that way an office-manager is in fact equated to a position of the Administrative Director of the company. - knowledge of a foreign language; this is obligatory requirement in the Western companies.